Welcome to the roller coaster capital of the world! 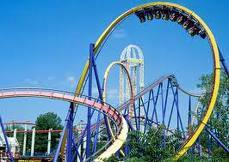 Cedar Point is located in Sandusky Ohio. Cedar Point has more roller coasters than any other park in the whole world! It is home to 17 fantastic roller coasters along with many other types of rides. The park is famous for some of its world record breaking roller coasters, such as the Millenneum Force and Top Thrill Dragster. It is also home to a very unique thrill ride called the Power Tower. These rides deliver extreme amounts of thrill, but there is more to these rides than the scream factor. These rides are uniquely engineered. The first roller coaster was invented by LaMarcus Adna Thompson. Thompson was born in 1848 and always showed an interest in mechanics. He got the idea for his first roller coaster from a railroad system. He called his first ride the Switchback Railway. The ride opened in Coney Island, New York in 1884. passengers would pay a nickle to ride and would have to climb up to where the roller coaster was. The cart would be released where it would travel 600 feet at a top speed of 6mph. Then when the cart reached the end of the track it would be switched to another track to go back to the beginning of the ride, hints the name switch back. After Thompson's inventions roller coasters took off. Coaster has gone from being a hilly track to being able to go upside down and from going only 6 mph to being able to go almost 150 mph. These vasts differences have all to do with the advancements that we have made in technology. Physics, Physics, and More Physics! Roller coasters are all about physics. From the start roller coasters are given a certain amount of energy. Most roller coasters get their energy from the top of the first hill or from a push at the beginning of the ride. The push at the beginning of a ride can come from many different complicated types of launch systems. A car can also be pulled up the first hill by different types of chain systems to gain it's initial energy. Through out the ride energy will be lost as kinetic sound energy and as kinetic thermal energy. The energy that is not lost will transform throughout the ride. As roller coasters go up a hill they will gain potential gravitational energy and as they go down the hill the potential gravitational energy will transform into kinetic mechanical energy. These complicated systems that give roller coasters their start and the energy transformations along the way is what these trilling machines are all about! As much as everyone wishes, most people just cant pack their bags and go on a thrill seeking adventure at Cedar Point. But don't fret! We'll take you on a tour of some of cedar points best rides. We will show you how they work and whats so special about them and you can even go on a virtual ride of the coasters! You'll experience the shook of being dropped from the top of the Power Tower, you'll almost feel the wind in your hair as you ride the world breaking behemoth known as the Millenneum Force, and you'll hold on to your hat as your go from 0 to 120 mph in just four seconds on the Top Thrill Dragster!